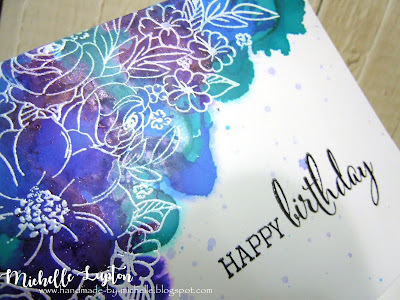 I really like the look of white embossing over alcohol ink, but I wanted to try making a card with some more white space (love my white space!). So this background was done on glossy cardstock, not Yupo - one reason is that Yupo warps when you heat emboss (it can be done, but you have to be VERY careful! ), and also I wasn't sure how I would go stamping the sentiment on Yupo. So I went with glossy cardstock. I used a floral stamp from Penny Black, and a sentiment from Clearly Besotted. I stamped the sentiment in Versafine onyx black, and I embossed it with clear embossing powder. 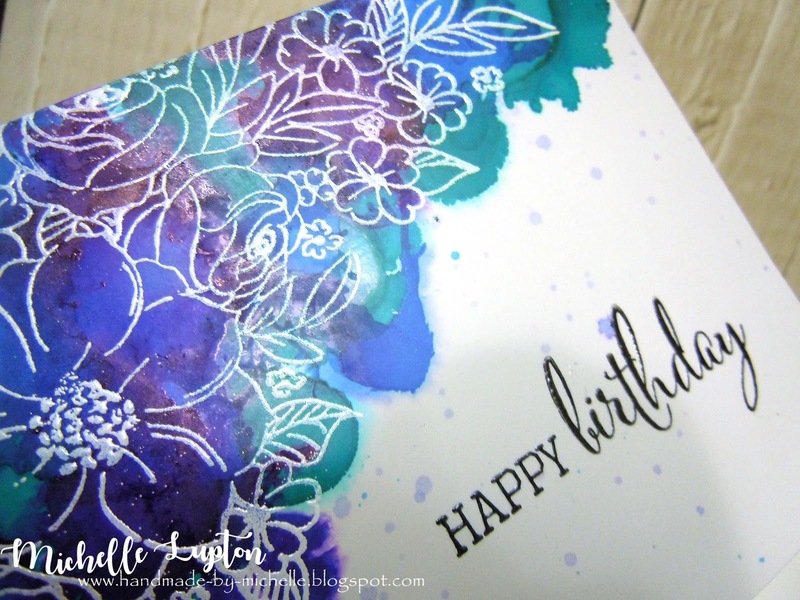 simple and so beautiful Michelle - love the colors! Looks fantastic. Thanks so much for sharing! This is such a beautiful card. 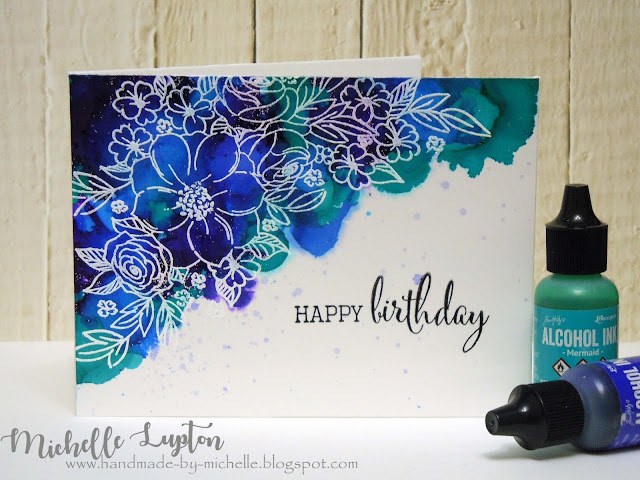 I've never embossed over alcohol inks but now I'm sure going to try. Such a beautiful card...I would love to case it but cannot find the Penny Black stamp. Could you please tell us its name? Many thanks. Thank you - the Penny Black stamp is called Flower Cascade. Beautiful! Going to give the heat embossing on the alcohol inks a try. Glad you said the Yupo paper warps. Need to find some glossy cardstock. What type do you use? What a lovely comment - thank you! Beautiful! I love the colors used and the white embossed image. Thank you for sharing the details. Hello from the A Blog Named Hero Facebook team!